Welcome to my website home. I'm the author of five novels for young adults and fiction (short and long) for adults. 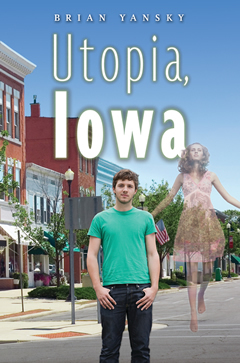 UTOPIA, IOWA and my duology ALIEN INVASION & OTHER INCONVENIENCES and HOMICIDAL ALIENS & OTHER DISAPPOINTMENTS are my most recent published works. My fiction isn't comic though there's always humor in it, along with serious and sad moments. The other usual thing about my novels is that while they're set in mostly real world settings, they're populated with, in addition to humans, ghosts, telepathic aliens, witches, a banshee and other supernatural characters. I can't seem to keep them out. I have an MFA from Vermont College, and a BA from the University of Texas. I live in Austin, Texas, with my wife, the illustrator Frances Yansky. Homicidal Alien & Other Disappointments, Candlewick Press (2013). Alien Invasion and Other Inconveniences, Candlewick Press (2010). Wonders of the World, Brian's second novel, came out in June, 2007. My Road Trip to the Pretty Girl Capital of the World was his first published novel.